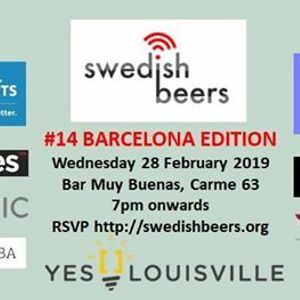 Plans are afoot for the upcoming edition of Swedish Beers in Barcelona in 2019. Brexit and the changes associated with it are looming, but Swedish Beers at MWC goes on. Please do RSVP and do feel free to share with your friends and colleagues in the mobile industry. The format will be the same - a relaxed evening, no formalities, no presentations. Just come with an open mind, be prepared to see friends old and new, chat, enjoy a drink or three (courtesy of our sponsors) and have yourself a good time. Oh, and leave the ties, the corporate personas and the sales spiel at the door please. The Swedish Beers crew will be on hand to welcome you as well as the friendliest bar staff in town. Tapas available to buy on the night. We will revert to a pay bar if/when the beer tokens run out. No admission after 01:00. Samsung Internet, 51 Degrees, Kairos Futures, Equal Experts, Noba, Redmill Marketing Associates, ZZZ.co.uk. There's still room for another couple of sponsors - more sponsors = more beer... you know you want to. Get in touch with Helen (c3dlZGlzaGJlZXJzIHwgZ21haWwgISBjb20=) and make some mobilists very happy. Please note, RSVP'ing here or on Facebook DOES NOT GUARANTEE YOU ENTRY! We managed to get everyone in who wanted to come last year so don't be put off! All are welcome to attend if you are working in and around the mobile industry and enjoy a good chat. You may be asked for ID on entry. And there might be a queue which usually goes down pretty quickly. We reserve the right to refuse entry. No admission after 01:00.